Talent hunts come and talent hunts go, and when too many of them come at the same time, there is a slew of music album releases and confusion on who is who. In this era when songs are released with rapid speed and tunes with bizarre lyrics but accompanied by foot tapping tunes are embraced by the public, an artiste with a different beat is a refreshing change for music lovers. Manjula Malkanthi is one such individual who had made it to the music scene. A former staff journalist and deputy editor of ANCL’s Tharuni magazine, Manjula is gifted with talents in diverse sectors in showbiz. 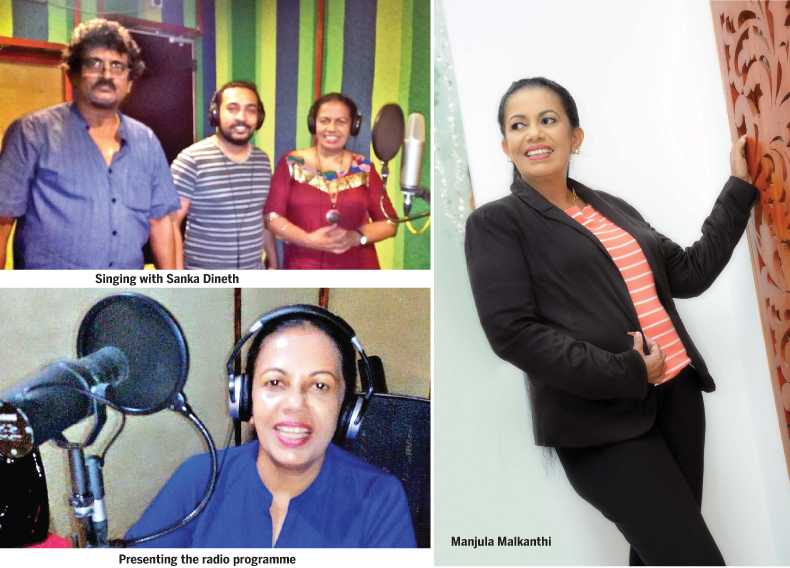 Armed with over two decades in media, Manjula ventured into the entertainment scene at a young age when she was chosen to voice Kekuli’s role in the renowned radio drama ‘Muwan Palassa’. She continued voicing the role for eight years. Meantime she also wrote lyrics, penned scripts and sang songs for Rupavahini. Her name is synonymous with Sudu Puncha’s role. She was also a B Grade singer at SLBC’s light song programmes. She is hoping to launch a CD of songs soon. The CD contains 15 tunerful tracks – 10 which have already been released into the Internet. She had dueted with Theekshana Anuradha, Rohana Bogoda and Jagath Wickramasinghe. She will be recording another duet with Punsiri Zoysa soon. The lyrics have been penned by Manjula, Badraji Mahinda Jayatileke, Saman Chandranath Weerasinghe, Shantha Kumara Vithana, Rathnalanaka Abeywickrama and Malika Rajapaksa. Rohana Bogoda, Sunil Dharmasena, Thashmira Senadeera and Badraji Mahinda Jayatileke had directed the music. Looking back on her stint in the field Manjula says that she has composed lyrics for children’s songs for Sujatha Attanayake for her Sangeetha Sandyawa. She had also composed lyrics for light song programmes. Manjula’s talents are not only limited to singing, writing lyrics and penning articles. She is the producer and announcer of the Hedakara Hendawa which is being broadcast on CRI Sri Lanka on Wednesdays from 2 pm to 4.30 pm. “It is a programmes which dishes out knowledge on diverse topics. The subjects we deal with are interesting and helpful to lead a healthy and quality life. You get topics related to health, entertainment, culinary arts, beauty, personality development and many more. We also play meaningful music. The topics are useful to anyone but ideal for women. It is my concept and I even named the programme. Our director Seelaratne Senerath has been very supportive towards this project,” she noted with gratitude. Chamila Vithanage supports her during the programme. A singer, an actress and script writer for TV as well as radio programmes, a senior journalist, deputy editor, editor, author of two books centered on beauty culture and a media personnel who is in charge of publicity for a renowned cosmetic brand, Manjula has added yet another feature to her cap of diverse skills by scripting the Christmas and New Year plays for CRI Sri Lanka annually. She has also scripted a drama with a novel twist for the channel for 2019. “The drama deals with an emotional story about two parents who have aged and have been sent to the streets by their children. 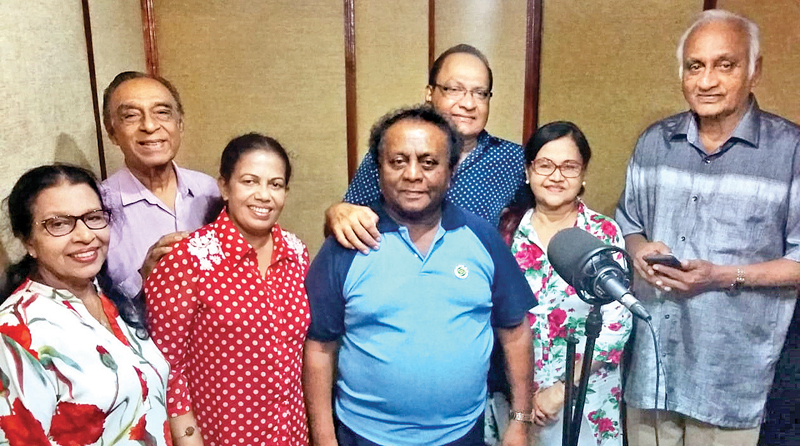 Sathischandra Edirisinghe, Ramya Vanigasekara, Wijeratne Warakagoda, Ananda Wickramage and Manel Wanaguru have voiced the characters in the drama. It is titled ‘Udu Yatikuru’. The specialty about this is that Sathischandra Edirisinghe has joined a radio programme after 25 years,” she expressed adding that the drama will be broadcasting on January 5. She is also getting set to pen a radio drama which comprises of several episodes. “That is something that I always wanted to do. I also wish to script a lengthy teledrama because I have only penned scripts for one day Poya teledramas so far,” she said.